Battle of the Books is a reading incentive program designed to encourage students to read quality literature. Students read books and come together usually in groups to demonstrate their abilities and to test their knowledge of the books they have read. 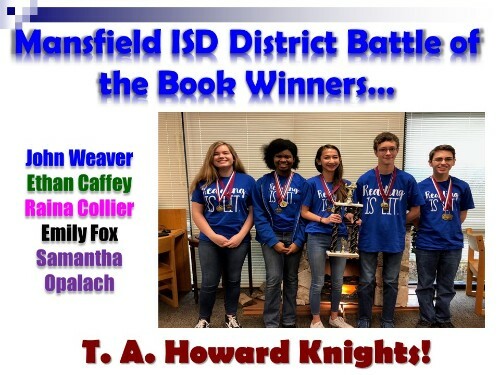 We are so proud of our campus Battle of the Books winners for 2018. They came together once again for the District competition and came home with the win. Congratulations to John Weaver, Ethan Caffey, Raina Collier, Emily Fox, and Samantha Opalach.